Distinctive houses in Porvoo, second oldest town in Finland. It is with some apprehension that I step into the "cryo-cabin", a metallic-blue cylinder just big enough for one person, for my super-cold spa treatment. Cryotherapy that dips to a temperature of minus 120 deg C is the draw at the historic Haikko Manor on the outskirts of Helsinki, the capital of Finland. For a moment, it seems ludicrous to appear in front of people I have just met - a bunch of uninitiated journalists - in my mismatched garb of swimsuit, mittens, warm socks and a beanie. Also, this is not something that I, a fan of beach holidays, would have signed up for. But it turns out to be one of the frosty delights - along with dips into nippy seawater and wintry walks - that I relish during our three-day trip in chilly October. In my cryo-chamber, tendrils of frosty air curl in a misty cloud around my head, creating the illusion that I am floating in a boiling cauldron. I gasp and do (ineffective) little jigs in the limited space of the cylinder, as prickles spread from my legs to my arms and neck. Imagine chilly air from your freezer blowing over you, just a dozen times stronger. Cryotherapy, which originated in Japan in the late 1970s, is said to slow ageing, relieve pain and inflammation in the joints, and even aid weight loss. While it was intended as a clinical treatment for conditions such as arthritis, others began using it to boost athletic performance and health. In our Finnish spa, the prescribed three minutes in the freezing chamber feels like an eternity. Two minutes and 54 seconds later, I bail and ask to be released from the cryo-cabin's icy grasp. Does cyrotherapy perk me up, improve my blood circulation or make my skin baby-smooth as promised? I am too numb with cold to know. Still quivering, I step into the steamy sauna area and sink gratefully into a jacuzzi warmed to a feverish 38 deg C.
Bliss, for one who has just travelled from the tropical climes of Singapore to the mediaeval town of Porvoo, a drive of 30 minutes from Helsinki. About an hour and various steam baths and saunas later, I, by now a molten human puddle, decide on a whim to jump into a cold pool (12 deg C) and start the cycle afresh. It is an unexpectedly invigorating ritual. After years of watching people hurtle from steamy saunas to icy lakes on television and YouTube, I finally "get" why the Finnish like it both hot and cold. The exhilaration of plunging into the super-cold chamber or an icy pool is preceded by palpitations of anticipation; then, skin prickling and rigid with cold, you luxuriate in the warm embrace of the sauna. The combined effect makes me so relaxed that I am nodding off over my dinner even without having had much to drink. It is also a great way to meet the normally reserved Finns. In every other steamy room we enter, they offer to gently educate us in the ways of the sauna: Like how it was the only Finnish word to enter the English language; the differences between a traditional sauna and a stove-fed smoke sauna; that Finnish women used to give birth in saunas; or how to make the room even hotter - the way they like it. In a traditional sauna, simply splash water on the hot stones to send a plume of steam over the room with a satisfying sizzle. They even have a name for this steam - loyly - incidentally also the name of a hip, new sauna that opened in Helsinki in May. Back in the capital city, Loyly is a public sauna on the Helsinki coast. The convenience of having saunas in their homes means that the number of public saunas have dwindled, but Loyly has made going to the sauna, once again, a communal experience for city dwellers, with a trendy touch. It is also a visual treat - an eco-friendly modern architectural gem, fabricated with 4,000 precision-cut pinewood planks, sprawls like a wooden sea star on the edge of the Baltic Sea. If a building can exude relaxation, this one does. I am told that in the summer, the many wooden decks are filled with Finns enjoying the sun in 20 to 25 deg C weather. But when I visit in the autumn, it is closer to 4 deg C.
While we walk the cobbled streets of Helsinki bundled in down coats and thick scarves, somehow, we manage to brave the biting cold in bikinis and one-piece bathing suits here. 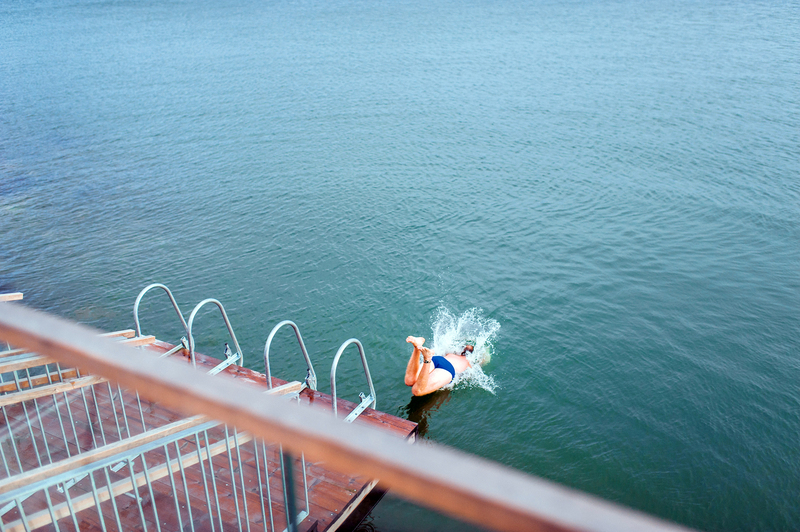 Emerging from the sauna room right onto an open, wooden deck, we jump into the steely sea water like it is a swimming pool: We scamper in our bathing suits, arms folded into our bodies against the wind, down the wooden steps to the ocean. There is a short climb down a ladder and, splash, our sauna-steamed bodies are immersed in 9 deg C water. Pins and needles run up my legs to my neck, an icy wave crests over my head and I taste the briny sea, which, surprisingly, is not that salty for sea water. Back in the sauna, we are laid out again like limp rags on wooden decks. The piney scent of wood smoke fills our lungs as we laugh at our audacity. Then the searing heat, radiating from an imposing black stove, evaporates all stiffness and numbness from our limbs. After two rounds of this oddly refreshing ritual, our host declares us "honorary Finns". We make it official with a round of beer and cider, downed while still in swimsuits and towels, around a log fire. The experience at Loyly offers a glimpse into Finnish culture as it combines many of the things Finland is known for - an obsession with saunas, great design with a minimalist aesthetic and a window to nature. 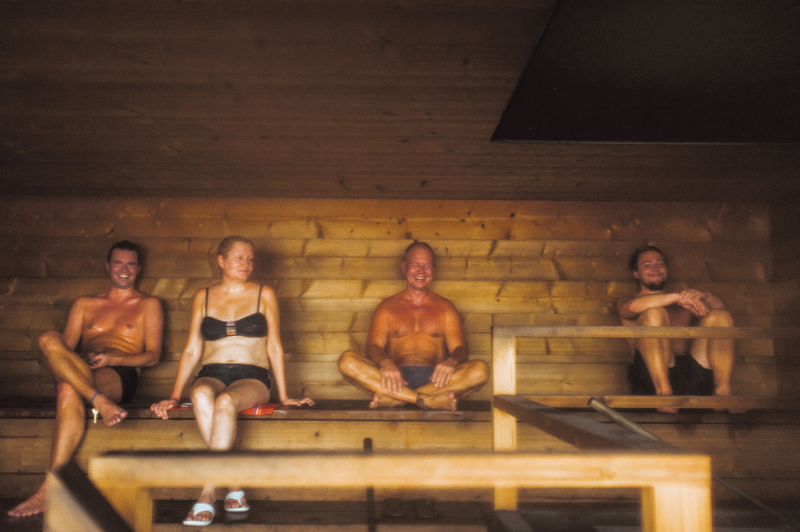 Today, saunas can be found everywhere in Finland - there are 3.3 million saunas for a country of 5.4 million Finns. You can also find them on cruise ships, at the Helskinki airport lounge and even on a ferris wheel - the "SkySauna" is a pinewood sauna cabin on the SkyWheel Helsinki. The city offers European tourist stops such as cathedrals, museums, shopping and food markets, with a Nordic touch, but the definitive Finnish experience has to be the sauna. And it seems to me that saunas calm not just the body, but also the spirit. It erases most of my jetlag and I sink into deep, dreamless sleep from my first night in Porvoo to my last night out of Helsinki on the airplane. It is gratifying, but also salubrious, and anything but flashy. This is part of a thread that strings together my experiences in Helsinki - the distillation of pleasure and beauty from simplicity. Meals, made with fresh, local produce, are tasty and unpretentious; designers extol function and express their disdain for the caprice of fashion; and despite the cold, Finns enjoy the outdoors and have an inborn respect for nature. One morning, we make friends with a Finnish forest on the isle of Emasalo near Porvoo. Our guide from adventure lodge Seikkailulaakso encourages us to quiet our minds and learn from the forest, which simply "is". As we traipse among birches, spruces and pines, we stretch our fingers to touch the springy moss, taste blueberries and lingonberries from under our feet, and feel the craggy surface of massive rocks stranded by glaciers from the ice age. More used to sweaty hikes in riotous tropical forests, I relish the emerald moss that cushions our every step and the calm that the stately trees impose. To heighten the experience, we close our eyes to enjoy the forest through our other senses and are told to wander off on our own for a bit (eyes open). I end up in a grove of conifers, where tiny birds are flitting overhead and all I hear is the wind whistling in the trees. Breathing the crisp, cool air and dwarfed by ageless trees, I feel content in a forest that seems timeless and endless. Like so many other experiences here, it is just a walk in the woods and much more.